That sounds pretty incredible doesn’t it? That’s what I thought too until I met an expert financial planner who was evaluating the affiliate marketing business. Todd Tresidder is a retired hedge fund manager who is now applying his wealth building skills for private clients. Todd had a great reputation as a hedge fund manager making his rich clients even richer, but in his own words he got tired of “making a few points” for his wealthy clientele so he sold the business and retired…at age 35. After a short time Todd discovered that retirement really didn’t suit him so he became a personal financial coach and opened his own organization. 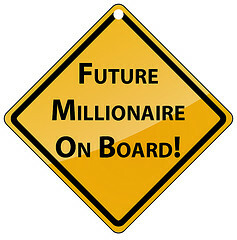 Will you retire as a millionaire? What’s the real value of your sales? At first I wasn’t really sure what he meant but he was looking at the business through the eyes of a financial planner not a marketer and he saw an incredible opportunity to build wealth. Let me walk you through how Todd was evaluating affiliate marketing. Todd’s financial planning clients were consistently earning an average of 4% on their retirement packages, packages that they had funded themselves. That 4% represented earnings on the principal…not dipping into the investment fund. The percentage replenished itself every year meaning the principal never lost its value. $100 per month is equal to a 4% return on $30,000. Now what makes affiliate marketing such an awesome wealth building opportunity? Todd’s clients had to plunk down the $30,000 out of their own money to create the principal. An affiliate marketer simply has to build their business until it reaches $100 in sales per month, no huge investment in principal because affiliate marketing, like the retirement package relies on passive income. In other words, when you hit $100 you could quit and you would receive $100 per month for the rest of your life because of the automated sales nature of the business. That is pretty cool. Now if you’re new to the business this whole retirement idea may sound nice but right now you’re struggling to get a site that will earn $100 so the whole issue may be moot. But don’t dismiss it. Having the value of passive income is just one more reason to keep at it and continue to build your business. Now here’s the good news. It is far more difficult to go from $0 per month to $100 than it is to go from $100 to $5,000 or $8,000 or whatever. The reason is rather obvious but many people overlook it because they are experiencing frustration getting started. It’s not just about picking a niche and a product and building a site. You need to know how to drive targeted traffic, how to build a list, how to develop a strong call to action and all of the rest. Going into the industry you don’t have this knowledge but as you learn and as you gain hands on experience you’ll develop the skill to make it work and when that first $100 month happens you’ll know you have arrived. When you hit that goal you know you are on the right track and then it’s a matter of rinse and repeat. Once you have the fundamentals mastered the dollars will roll in. Todd and I both agree that the number one reason that people don’t succeed in affiliate marketing, or any other business for that matter, is they don’t have the persistence required to stay with it until it works. Don’t fall into that trap. The rewards are just too important to give up on. Now back to your retirement…how much money do you need? When to retire and how much you will need in the way of income are really personal issues. Lifestyles vary as do retirement objectives. The real challenge for the affiliate marketer is to determine “how much money do I need to retire” to support the way of life that I want. Todd has written a book titled appropriately enough “How Much Do I Need To Retire” which has helped many of his clients determine their financial planning. Your planning will be less complicated than most thanks to the nature of passive income. Figure out how much you’ll need to retire and then keep building your business until you reach that monthly goal…then quit. It really can be that simple. For example if you plan on using your affiliate business to fund part of your retirement and you need $2500 per month, build the business until you hit that number. And check this out. Your neighbor down the street also needs $2500 per month but in order to get it, he or she will have to come up with $1,000,000 to fund their retirement ($2500 equals 3% interest on $1,000,000 divided by 12 months). Now that’s what I call wealth building.